Introduced a few years ago just as gas prices were beginning to race skyward, the Honda Fit now looks like a happy little piece of automotive prophecy. A subcompact four-door hatchback, the Honda Fit has earned praise for its world-class engineering and design, and it has definitely found its niche with consumers, particularly with the arrival of the second-generation model. With either generation, you'll find crisp handling, an adaptable interior, high-quality fit and finish and a relatively low price. For small-car shoppers, the Honda Fit represents an almost ideal package. 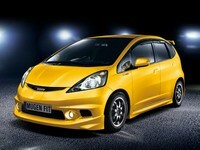 On this site you can read and download Honda Fit owners, navigation and service manuals. The Honda Fit debuted in June 2001 in Japan and immediately became a big hit. By December 2001, it had outsold the Toyota Corolla, and ranked first in sales for nine out of twelve months in 2002. It subsequently was introduced in Europe (early 2002), Australia (late 2002), South America (early 2003), South Africa and South-East Asia (2003), China (Sep 2004), and Mexico (late 2005).